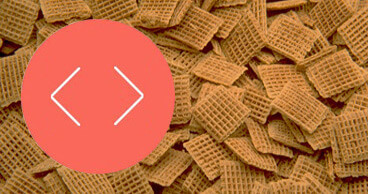 Let us show you a range of possibilities for measuring textural properties of cereal products with a texture analyser. 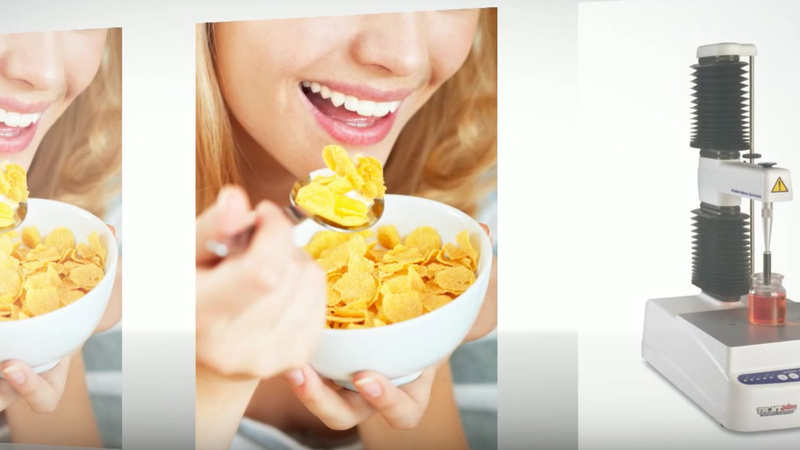 The need for convenience as well as on-the-go meal alternatives, such as cereal bars, has been propelling the processed food industry, which includes breakfast cereals. Developed nations already have breakfast cereals as part of their regular course of meals, while increasing income in developing countries and changing food habits is giving the industry a new dimension. Special emphasis on healthy living has prompted market players to introduce new products, which suit all age groups and lifestyles. International players in the breakfast cereals market are also focusing on reformulating their products by replacing harmful hydrogenated fat and oils with healthier ingredients such as fibre and fruits. Demand for gluten-free cereals has increased in the market, especially in North America and Europe. There also has been an increase in demand for whole-grain cereals worldwide. Texture analysis is a key part of product development in this sector. Crispness and bowl life in particular are vital to consumer acceptance as well as firmness, consistency and stickiness of semi-solid cereal products such as porridge, oatmeal and couscous. 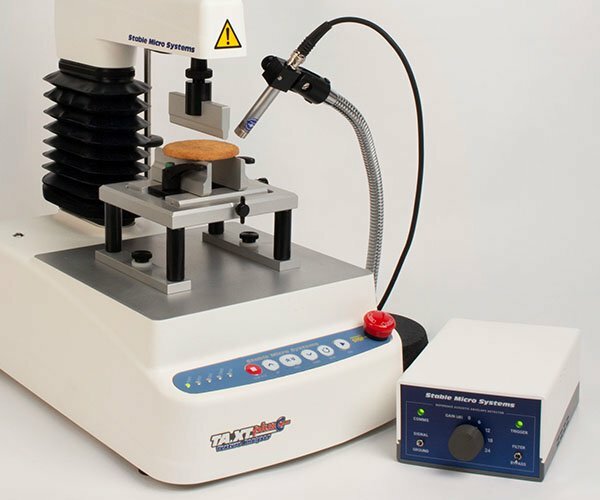 A wide range of CEREAL PRODUCT test methods (including AACC and AIB Standards) is built into Exponent Texture Analyser software and will automatically load at the click of a button. We help make your testing quicker to access and the analysis of your product properties already prepared for you. As attendees at each annual AACC, ICC and IFT meeting, as well as being members of Campden BRI's Cereals, Milling & Baking Panel, we are sure to be abreast of the requirements of the industry and our customers. No one knows more about the texture analysis of cereal products – but don’t just take our word for it, read an example of what our customers have to say. A selection of special attachments and typical measurements which are commonly used in this application area are shown below, although this does not necessarily include the complete range available for the testing of cereal products. Test procedures include: compression, puncture / penetration, tension, fracture / bending, extrusion, cutting / shearing. 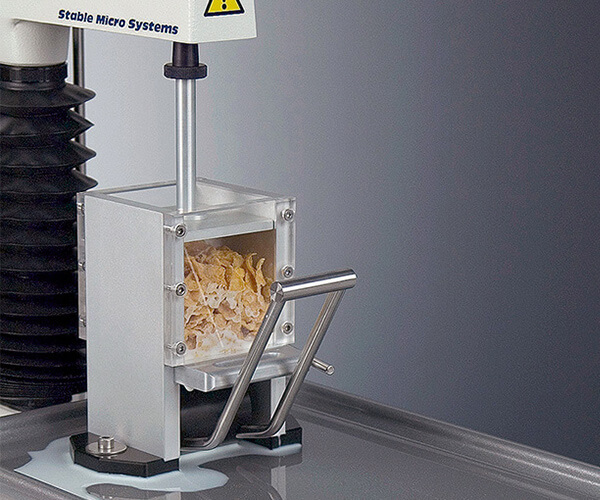 'Bowl Life' testing of Breakfast Cereals is made possible through the use of an Ottawa Cell, watertight base plate and liquid catchment tray. Can be used for the shearing of dry cereal products. 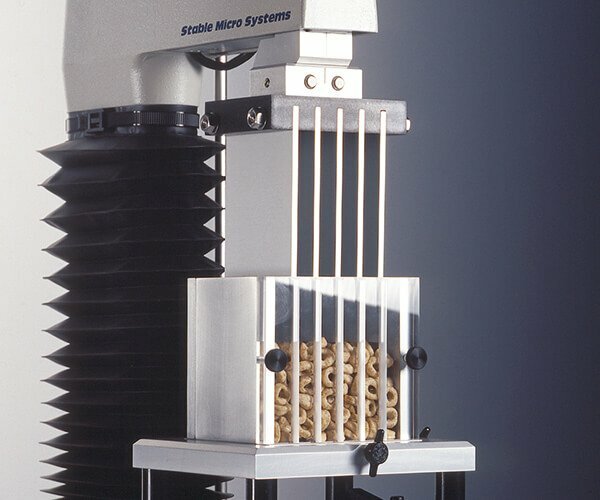 Allow the collection of acoustic data during a test and the synchronisation of force data with video frames - of particular interest for the testing of brittle products.